Adaptive Stroller! – How do you do, Miss Mary Lou? This has been in the works for quite a while. 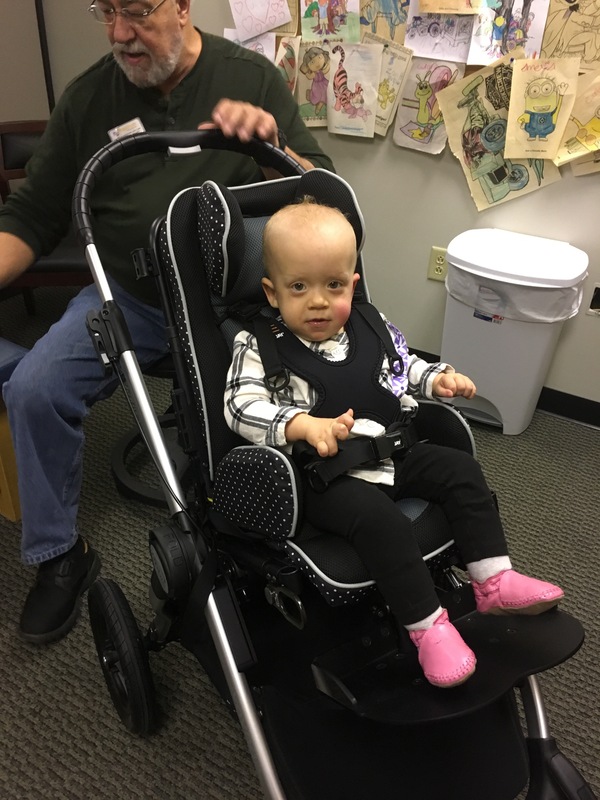 While Mary isn’t the most obvious candidate for an adaptive stroller, this is a major upgrade for her and very helpful overall. She can support herself decently on a solid surface. But strollers aren’t very solid and Mary generally ended up pretty slumped over in hers and the buckles were hard and uncomfortable and attached right where her g-tube is on her belly. Plus, she wasn’t up high enough for easy interaction and she was fairly enclosed in her old stroller. Now, she’s very well-supported, up higher, and sits with good posture. She seems thrilled with the change and so are we. She immediately seemed more comfortable interacting with people and it feels easier to take her places with such a safe, comfortable place for her to be. Yay! This is sweet to see. Thanks for sharing this. I’m looking for an adaptive stroller for my son, too. Can you tell me the brand and model of this one Mary is using?